So next week is Mother’s Day, you guys! I feel like I’ve started every recent post by saying how fast time is flying. I suppose I cannot help it because of our current season of life. But with Mother’s Day 2016 grinning at us on the horizon, I cannot help but think about how last Mother’s Day seems so long ago. A wasn’t even a full year old and T wasn’t even on her way! What a difference a year can make. So here we are preparing for another Mother’s Day. If your family is anything like ours, Mother’s Day will likely consist of a low-key day filled with relaxation, love and delicious brunch food. 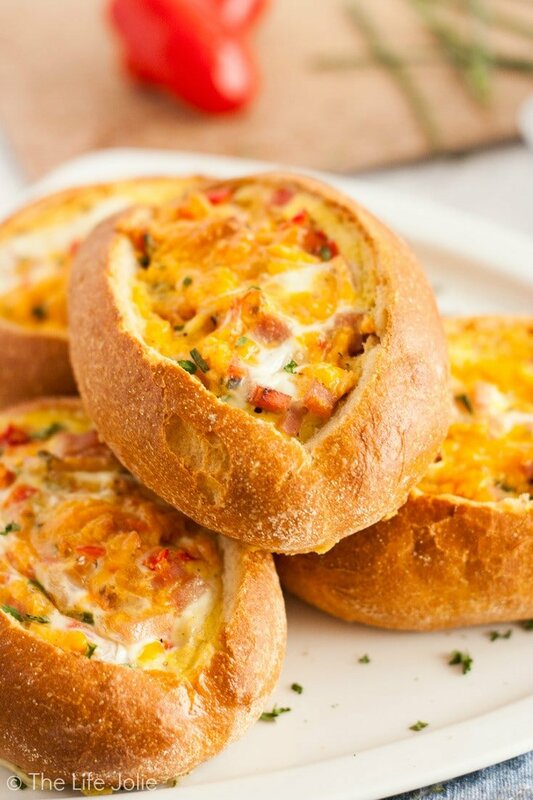 With this in mind, I would be remiss if I didn’t share this fantastic Egg Stuffed Bread that I recently whipped up. It is so good, in fact, that I decided to push it ahead of all the other recipes I had planned to share (trust me, your Mom will be glad!). 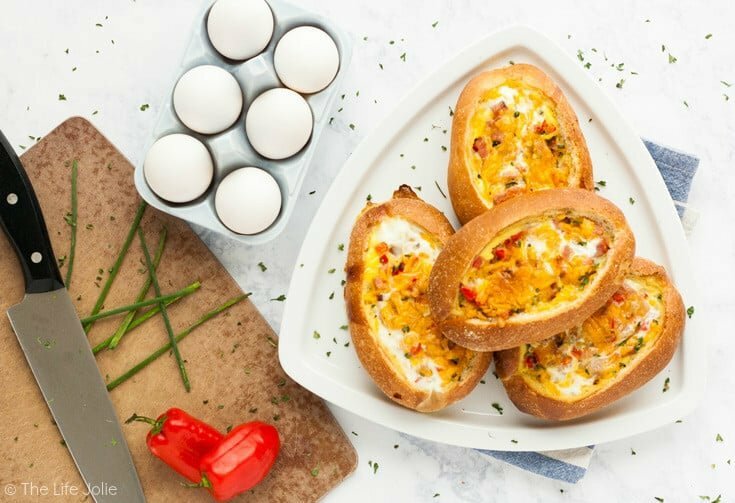 When we were trying to think of brunch recipes for my cousin’s bridal shower (which was a couple weeks ago) I got this idea to stuff bread with an Omelette. 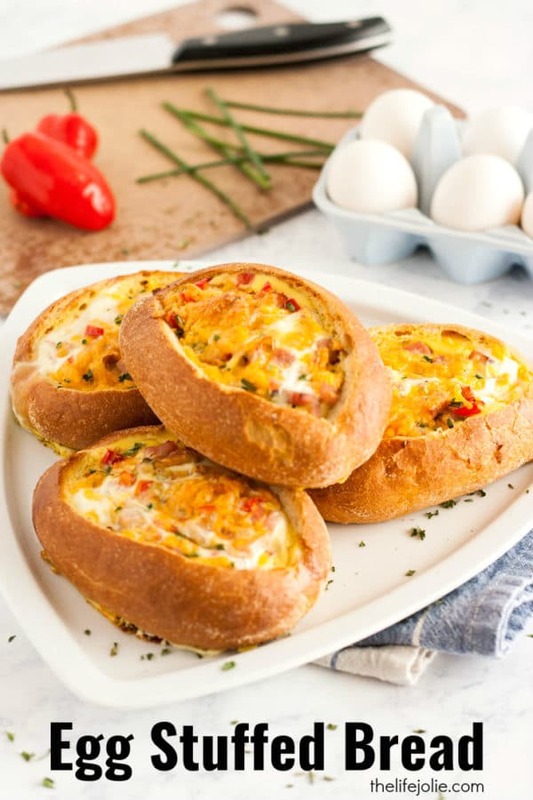 After all, Omelettes and bread can really only make each other better. But being that our bride is Gluten-Free, we ultimately scrapped that idea in favor of a few different Crustless Quiches (one of which I will share with you soon!). Still, I couldn’t get the Egg Stuffed Bread concept out of my mind, so I grabbed a few baguette rolls and some tasty items that happened to be hanging out in my fridge and got to work! 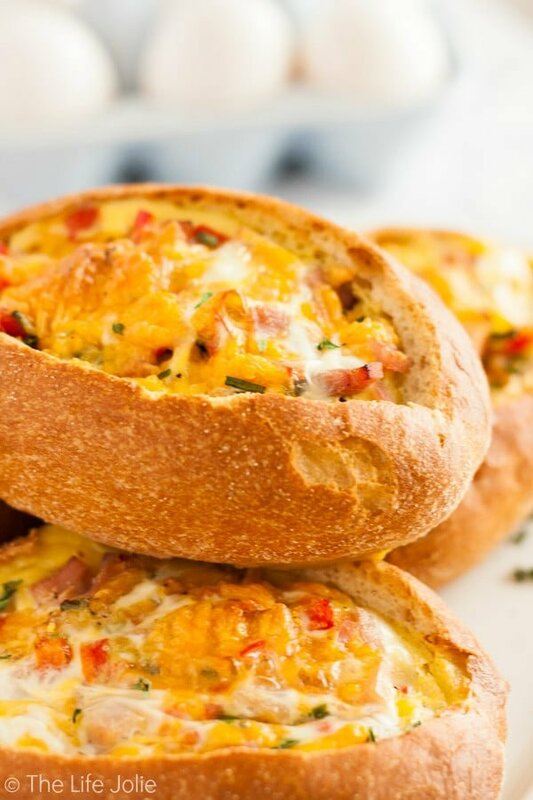 What resulted was a super-tasty, really simple Egg Stuffed Bread that had a deliciously, custard-y center, and is filled with Ham, Peppers, Chives and cheese. The great thing is, you can really take these in any direction you’d like! Got spinach and artichokes in your fridge? Awesome, throw them in. Prefer Gruyere cheese over Cheddar? No problem, swap them out! Hollow out your bread so that it forms a boat. Make sure you don’t cut all the way through! I left a small amount of the bread in the middle which absorbed some of the egg and helped create the delicious, custard-y texture. 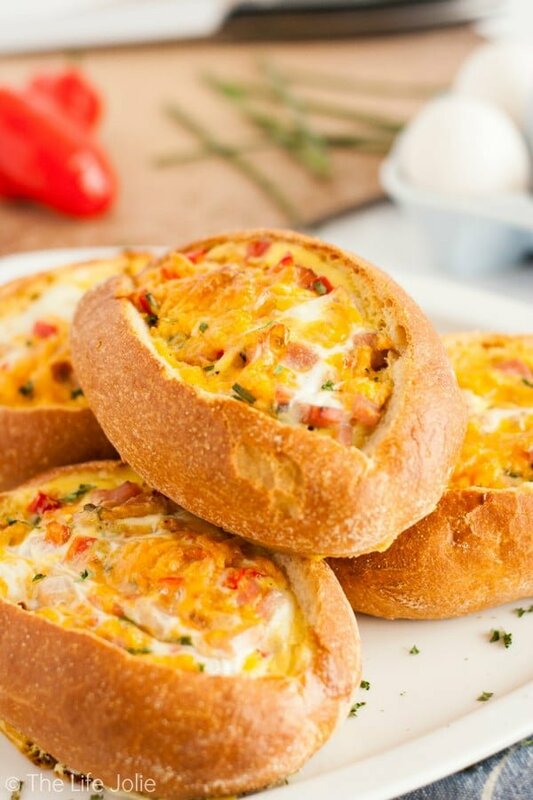 Split your omelette fillings between the rolls and then top each with your cheese. Place them on a foil-lined pan and set aside. In a separate bowl, beat together your eggs, milk, salt and pepper until well combined. Very carefully, pour your egg mixture equally into each bread boat. You’ll want to take your time because it takes a second for the fillings and bread to absorb the egg and if you go to fast they will overflow. Don’t beat yourself up if they end up overflowing a little. Mine did and they still came out great. You’ll just cut off the egg that cooks around them before you serving. Bake for about 30 minutes (give or take a few minutes depending on your oven and the size of your rolls). Serve immediately for best results, or refrigerate and reheat.